Why City taxpayers pay more for policing than the District. Are you new to municipal elections? Here is some useful information about the City of North Vancouver and some of the technical terms that you will hear during the election. 1. I am not sure if I live in the City of North Vancouver or the District of North Vancouver. What is the boundary? 2. Why are there two municipalities? The current boundary was drawn over 100 years ago based on the properties owned by two major developers plus Moodyville, which joined the City a few years after North Vancouver was divided up As of 2016, the population of the City of North Vancouver was around 56,000 and the population of the District of North Vancouver was around 85,000. 3. Do the City and the District cooperate? To some extent they do. They cooperate on policing and recreation & culture. They do not cooperate on fire departments, libraries, business licensing, bylaw enforcement, or development and traffic planning. Many functions are duplicated. 4. What is the big deal about a potential amalgamation between the City of North Vancouver and the District of North Vancouver? Why would that happen? The separation of the City and District is based on somewhat random historical acts. The question of whether they should be merged today depends on who will benefit from amalgamation and how. Affected parties include residents, businesses, municipal governments, municipal employees, and service providers such as police, fire and emergency services, to name a few. There are many factors to consider. What are tax rates in each municipality? What liabilities exist for aging infrastructure? Are there economies of scale to be gained? Would planning and city services be improved? Sound data is necessary to assess the costs and benefits of amalgamation to everyone involved. Once that that data is available, the matter needs to be put to a referendum in each separate municipality. 5. What is an OCP? OCP stands for “Official Community Plan”. It is a statement of objectives and policies to guide decisions on planning and land use management, within the area covered by the plan, respecting the purposes of local government. It does not commit the municipality to any particular project or change zoning, in and of itself. You can find the City of North Vancouver’s OCP here. 6. What does zoning mean? Zoning controls land use and building size. It is how a municipal government manages land development. Municipal laws identify where different types of land use—residential, industrial, recreational or commercial—are permitted and how big a building can be relative to the area of the land. A variance, which can be granted by council after an application, can allow a deviation from the normal set of rules that apply to land use and development. Density is a term that refers to the maximum floor space of a building relative to the size of the lot. Density plus the height restriction determines the size of a building. The more allowable square footage and floors, the higher the density. High density means bigger buildings and more people. 8. Why would council allow higher density than zoning regulations permit? Council may increase density because they want to allow a developer to build a bigger building in exchange for something of value to the community. 9. What is an “amenity”? An amenity is something of value that council obtains for the community in return for granting the developer additional density and the opportunity for more profit. If this is done responsibly, a municipality can get amenities for the whole community such as parks, libraries, recreation centres, accessible or low income housing to be paid for partly or wholly by a developer. Unfortunately, if this is done irresponsibly, then a developer may profit without fair value being given to the municipality in exchange. 10. What happens if a council allows too much development in a municipality? If developers are allowed to overbuild, then this puts a burden on municipal infrastructure such as roads, parking, transit, hospitals, schools and public spaces. All of those services must be considered before granting additional density to developers. 11. Why can’t I build what I want on my own property? I own it, after all! One reason for zoning laws is to segregate uses that are not generally felt to be compatible. For example, most people would not like a barn with livestock to be installed next door to their house. Another reason is to stop new development from unreasonably affecting or interfering with the properties around it. This helps a municipality preserve the “character” of a community. 12. Apart from governing zoning, what else does a municipality do? In Canada, the power to govern is assigned to the federal government and provincial governments. Provincial governments give authority to municipalities to regulate areas such as libraries, parks, community water systems, local police, roadways, businesses, pets and parking. 13. What about business licensing? A municipality may require you obtain a license depending on your business location and type of business activity. In the City of North Vancouver, a business is required for both commercial and home-based businesses. The licence fees depend on the number of people working, the amount of space occupied and other criteria. 14. Do business owners get to vote in municipal elections? No, they do not, unless they are residents of the City of North Vancouver. 15. How does a municipality get its funding? Municipalities raise funds for their operations primarily through property taxes, but also through utility charges and various fees. 16. What is a “mill rate”? The mill rate is the amount of tax payable per $1000 of the assessed value of a property. The mill rate is set annually by council. The tax rate is different depending on the class of property (residential, commercial, industrial, and so on). 17. 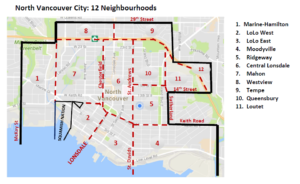 How big is the council of the City of North Vancouver? There are six councillors plus the mayor. The mayor has an equal vote to any of the councillors. 18. I don’t know who to vote for. Are there any political parties in the City of North Vancouver? In some Lower Mainland communities, there are civic parties. In the City of Vancouver, for example, civic parties have included Vision Vancouver, NPA, COPE and the Green Party of Vancouver. There are no declared civic parties in the City of North Vancouver although certain councillors routinely vote as a bloc. This makes it especially important to research the individual candidates to be sure you know what they stand for. 19. Why should I bother voting in the municipal election? The municipal level of government has the biggest impact on our day-to-day lives. There is traditionally a low turn-out for municipal elections. In the last City of North Vancouver municipal election, the turnout was approximately 30%. Many people vote on name recognition alone. Others vote for the first names listed and, since ballot is in alphabetical order, this results in a bias toward the earlier part of the alphabet (especially against new or less well-known candidates). If you don’t like the direction the City of North Vancouver is going, then be sure to do some homework. Attend town hall debates or check out the North Shore News. Call or email candidates to ask their views. Please vote!